Discussion in 'other anti-malware software' started by erikloman, May 25, 2012. Very good. I just sent an email to that address. Whenever I've used the "Keystroke encryption" feature, I've had to deal with issues such as keystrokes being "eaten" and Alt+Tab issues. For example, if I hit Ctrl+W to close a browser tab, or Ctrl+F to open the Find box, nothing happens until I do it a second time. And if I hit Alt+Tab, I have to hit space or Enter, or click, to dismiss the Alt+Tab window. Is it just me? I want to use this feature, but this is very annoying, and it causes problems when I (for example) hit Ctrl+W too many times. I'm using HP.A 3.7.9 build 775 on Win10 Pro x64 1809, but this issue spans at least several versions of each. Edit: I've found at least one reference to this issue. For me, it's not intermittent, and is not restricted to Chrome. The first few keystrokes being lost in address bar, search field, or web forms, sometimes, not always, that is the only thing of the issues that you mention that I notice, not the other issues you mention. On my system, I never tested if it is HMPA Keystroke Encryption, or perhaps G Data IS Keylogger protection, or a combination of things that cause those missing keystrokes. To me, the occasional few first keystrokes being lost is not a very big deal - even though it is not ideal, of course. For me, it happens every single time. Just now I hit Alt+D and it took three tries to get it to work. It's very annoying to me, so I guess I will turn that feature off--even though I really like the idea of using it. I did not know Alt+D before, seems the same as Ctrl+L. Could it be that some other anti-malware software, or some specific setting that you made, is a factor in the issues that you reported? They work for me as well, but it takes multiple tries. And in a totally reproducible manner, only when keyboard encryption is enabled. Guess it's my imagination. I do this for a living and I hear it all the time. Then when the system totally crashes they come screaming for me. "This is currently a known issue and it is unlikely to be fixed in the near term. The workaround as you know is to disable keystroke logging protection if it is causing significant issues while using alt-tab. Please note this issue may be addressed in a future update." so, I suppose I'll just continue to leave it off. happy somebody within the company directly confirmed it. Do you plan to protect against the vulnerability (Spoiler) of the Intel processors? With this setting, can the HotmanPro.Alert work well in sandboxie sandbox? I can suggest a site to buy HitmanPro Alert or HitmanPro at a lower price, I only discovered a discount coupon. Protect or not protect? That is the question! Does this reproduce over a reboot? Did you add JDownloader manually to protected? 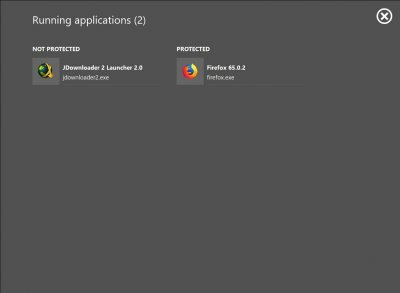 On my win10 machine jDownloader is under unprotected only. I remember as a java application, HitmanPro recognized it during installation. Where to get a free license to test HitmanPro Alert ? I already contacted Ronny and Erikloman without receiving any reply. If you never used the free 30-day trial, I suppose you should be able to use that, as the website says. If you tried it before, you would need a new trial license. If Ronny, Erik, or Mark don't reply to your request, then I guess Sophos' policy regarding free trials may be stricter than SurfRight's earlier policy. Thank you ! In the meanwhile without a license I can't give any feedback. I think that applies/d to those wiling to test their beta versions. I also don't know if it still applies, but nothing ventured nothing gained. I've seen this game trying to manipulate security modules before but, in this case seems that is trying to use an already corrupted windows explorer to inject into Malwarebytes service? Am I right? I'm using HMPA build 759 on win 7/64 machine + Malwarebytes. The game corrupts windows explorer 6.1 after every update of the game but never seen this kind of injection and also can somebody explain what means in this report "Mitigation Lockdown" My wild guess is that; the game updating used automated ROP ,corrupted explorer and now tries to shutdown MBAM. Don't know what to think. False positive? The current release is at build 775. I know, I updated . That is not an issue/ the version of HPA. It had good detection of ROP before 759, it improved in latest builds I bet plus other fixes. I love HPA it grown on me gradually. I hope they will add mitigation for portable applications soon as long as I know they planing. HitmanPro.Alert protects JDownloader if I configure it for the browser, but It is a java application. If I set it as a java application, it will not protect HitmanPro.Alert, see above. It is bug: HitmanPro.Alert recognizes JDownloader2 as a Java application (correctly), but only protects it as a browser application.